The likely hood for an event to occur. In a stud game any pair appearing in the first two dealt cards (Backed Up). A Seven-card stud game where the hand with the highest spade would win half the pot. (1) A person who is dealing the cards in a game. (2) The person who operates a game in a casino. The advantage and disadvantage available to a player in comparison to other players. (1) A cheating player. (2) A player who trying to win pots by intentionally miscalling his hand. A hand reappearing again on the next deal due to inadequate shuffling. A player who has only been at a table for a short time and leaves after winning a big pot is said to have hit and run. An opponent who bets or raises for a player who is sandbagging a good hand. Similar to Cincinnati, but the lowest exposed card and all other cards similar to it are wild. A pile of discarded cards in front of the dealer, or putting cards in the pile of discards. 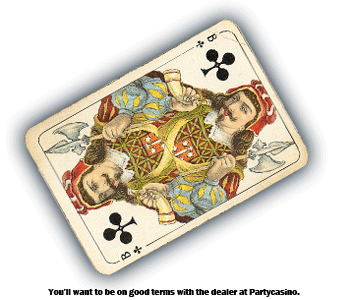 A player in a casino or a poker room using advanced concepts. A straight with four cards which is only open on one end like jack, queen, king, ace. An lowball hand which cannot be beaten, like ace, two, three, four, five, or ace, two, three, four, six, or two, three, four, five, seven according to the game which is being played. A game that has four cards in every hand and three cards on the table which are rolled and the last card and other similar cards would be wild. An expression used for confirming the whereabouts of a player who leaves a game due of heavy losses. A Seven-card game where the first four cards are given to a player facing down and then a player needs to turn any two up. If a player would like to play at another table other than the one where he is currently at he can ask the floor for a table change. (1) The anteing ace. (2) The pair with the higher value-- e.g., queens and tens is queens up.